This walk: 2014-9-24. Bedford Bridge, clay pit, brick works, Wheal Franco copper mine, common polypody fern, Screw Bridge, Sustrans "27" cycle route, oak, bird cherry, hawthorn, Brentor, Gem Cottage, benches, bracket fungus, sloes, oak apples, Himalayan honeysuckle, Horrabridge poster, Magpie Viaduct, bind weed, red admiral, ponies. Previous walks in this area: 26 Jan. 2011, 16 Nov. 2011 & 28 March 2012. Link to the 1884 Ordnance Survey map of the area (Scale: 6-inches to the mile) - click or thumbwheel into the top left area on the map. NB - Most photos here were taken during a "recce" walk on 11th Sept.
Bedford or Magpie Bridge over the River Walkham, built 1822. There was a tall white building to the right, which was the King's Arms in 1850 but Crossing knew it as The Magpie Inn. Nearby, Magpie Mill produced violin strings. Within sight of the bridge is this feature ..... purpose not known to us, although it is close to the bank of ther River Walkham - which is very shallow. Perhaps it was a crane base for the clay / brick / mining works that were once here although it is concrete and what is the function of the manhole? Near Bedford Bridge, close to the old clay pit used by the West Devon Brick Works ..... the Wheal Franco copper mine (1823-1875) also operated in this area (see the old map link above) although mostly across the main road. It went down to 160 fathoms (960 feet) and employed 130 men. Between 1846 and 1862, it raised over 10,000 tons of ore, worth £51,500. The path near the start of the walk, almost on the bank of the River Walkham. Epiphytic ferns, Common polypoly (Polypodium vulgare) growing on an oak tree. The majesty of the trees. Looking north down on part of the "27" Sustrans cycle track from Screw Bridge - a corruption of "skew" because it is neither straight across the old railway nor is it level? Another view of Screw Bridge. The track through the trees. Looking up towards open common. The bases of the leaves, showing small (possibly reduced in this tree, compared to other examples) lobes where the leaf joins the leaf stalk. Zoomed view to Brentor, 10.8 km (6.7 miles) distant on a bearing of 343° - it was very hazy in the distance. Trunk of a very gnarled, and perhaps ancient, hawthorn tree (Cretaegus monogyna). Memorial plaque on the bench. Another group photograph, showing some of the scenery. A distant tor that was extremely faint and hazy on the day, it is highly enhanced here. It was viewed from the bench using a Silva Type 54 prismatic compass, recording a bearing of close to 20°: either Great Links or High Willhays. High Willhays on Google Earth, rotated to an approx. 20° viewpoint and tilted to get a low-angle viewpoint - but from ground level is not possible! Distance: 21 km (13 miles), at a bearing of 20° from the bench viewpoint. Great Links on Google Earth, rotated to an approx. 20° viewpoint and tilted to get a low-angle viewpoint - but from ground level is not possible! Distance: km 17 (11 miles), at a bearing of 15° from the bench viewpoint. Memorial plaques on the bench. House name marked on the OS 1:25k map. Oak apples, caused by the oak gall wasp. On the road / cycle track along the old Great Western Railway line (Launceston branch). Notices at the start of the cycle track section. Strolling along Old Station Road - this being the old railway track. As previous photograph, a garden escapee, invasive in several countries - the remaining white flower identifies it as "formosa" rather than the golden yellow-flowered "crocothyrsos". The path / cycle track towards Magpie Viaduct. Massive seats (?) at SX 50675 69896. Hedge bindweed or bellbind, Castegia sepium, with it's large pure white flower. Footpath off to the right to go down below Magpie Viaduct. Hidden in the tees, to the right of the viaduct, are the original brick-built piers that supported Brunel's trestles that carried the railway. Close-up of the under surface. Red admiral, Vanessa atalanta, on bracken: a nectar feeder while the caterpillar feeds and forms a chrysalis on stinging nettles. In September, these butterflies are flying south on their migration to the continent - few survive hibernation in this country. Back to the old clay area near the car park. Just ignore that chap over there with a camera. 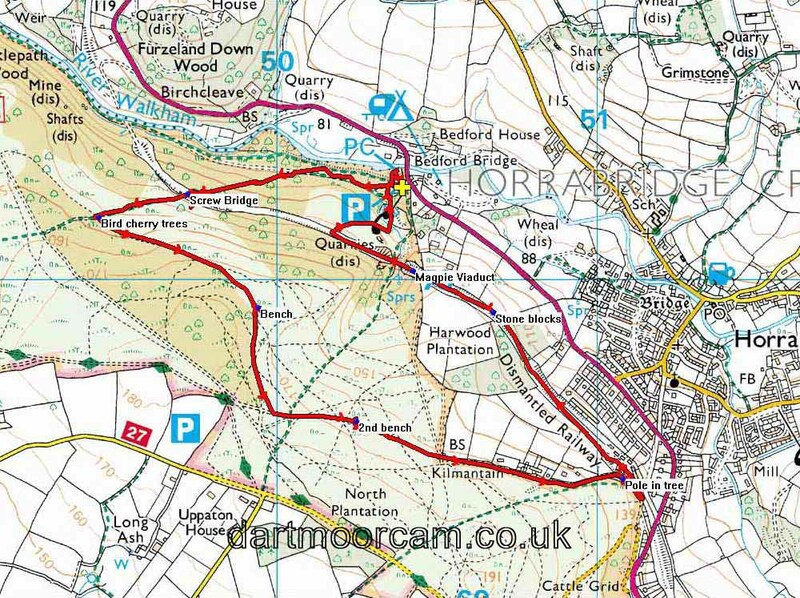 This walk was easily accessed from the car park (marked with the yellow cross and the P symbol on the map) which is right beside the A386 Horrabridge to Tavistock road, at the bottom of the hill after Horrabridge just before the bridge over the River Walkham. Distance - 5.27 km / 3.28 miles.